When 9Marks 1 asked me to review When Helping Hurts, I already had the book in hand. It’s an intriguing title, and I had read a glowing review from one of the many notable people who filled the first six pages of the book with impressive endorsements. There are many good reasons for such praise. The authors present their thoughts in a well-organized manner, moving from theory to application. First, they develop foundational concepts for helping the poor (chapters 1-3). Then building on those, they articulate general principles (chapters 4-6) followed by practical strategies (chapters 7-9). This book comes at the right time, as many North American Christians and churches have a growing interest in helping low-income people. The authors do a fantastic job of appropriately directing this zeal by providing insight on how good intentions can actually make matters worse for those in poverty. (Think of thoughtlessly wrapping a wound with unsanitary bandages.) They do this by providing real-life examples of difficult situations and ask us North American Christians, “What would you do to help?” Then they humbly show how our knee-jerk reactions may actually lead to a different outcome than what we hoped for. It’s very practical and very thought provoking. This is the book’s greatest overall strength. What kind of relief is needed? We have to understand the situation first and work with the poor, not for them (111). Also, instead of primarily assessing what the poor need, we should note what resources God has already blessed them with that can be used to help (126). Who can offer the best help? Those closest to the situation are responsible to help and will better understand how to help (112). Poverty alleviation often fails because of inadequate participation by the poor themselves in the process (142). Including the poor in their relief helps them work and take responsibility as God created them to do. What should our attitudes be in helping? Humility is essential. We are all broken (79). We must avoid communicating, however unintentionally, that those helping are superior, which adds to the feelings of shame and inferiority. Many in poverty are plagued by such feelings (65). In other words, it’s not just physical resources they need (53). If all this isn’t enough, the authors include three practical chapters on micro-financing solutions and cautions, gentrification and training ministries, and a really useful chapter on short-term missions. Perhaps I’m picking the few weeds among the garden of roses here, but while this book’s wisdom and practicality are to be commended, I think there are some things that could be done to make it a bit better. First, I wish there was a stronger emphasis on preaching the gospel. 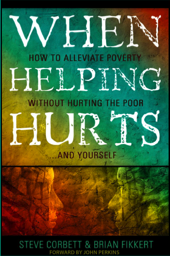 If the authors ever come out with a sequel, I would love to see some attention given to how to practically evangelize through poverty alleviation efforts. Perhaps the sequel could be entitled When Poverty Enriches (2 Corinthians 8:9). While the authors are very clear that no reconciliation happens without the proclamation of the gospel (80), they seem to downplay its importance. For example, they state that in their sampling of thousands of evangelical Christians, over 99 per cent aren’t remotely close to answering the question “Why did Jesus come to earth?” correctly because they all say that Jesus came to save us from our sins (33)! Further, the authors go on to say that “saving souls is only a subset of the comprehensive healing of the entire cosmos that Jesus’ kingdom brings and that was the centerpiece of His message” (33; emphasis mine). While it’s true that Jesus’ mission involves more than saving individuals, saving individuals is far more central to Jesus’ mission than this statement would indicate. Didn’t the Apostle Paul say, “Christ Jesus came into the world to save sinners” (1 Timothy 1:15)? Was the healing of the cosmos more central to Jesus’ message than the salvation of those made in God’s image, the pinnacle of his creation? I don’t think so, at least not from the emphasis given throughout Scripture (e.g. 1 Corinthians 15:3). In our efforts to relieve temporal suffering, we must also seek—and seek most of all—to relieve the far weightier eternal suffering through the proclamation of the gospel. Second, I would have liked to see a more careful handling of scriptural texts. For example, the authors ask, “For what sins was Israel sent into captivity?” According to Corbett and Fikkert, it wasn’t primarily idolatry, but “that God was furious over Israel’s failure to care for the poor and the oppressed” (40). It’s true that the prophets often spoke of Israel’s failure to care for the poor and hurting (e.g. Isaiah 3:14-15; 10:2; Jeremiah 2:34; Ezekiel 22:29). But we must not let the tail wag the dog. Giving primary emphasis to caring for the poor rather than idolatry reverses the two greatest commandments by placing love of neighbor over love of God. Our zeal for helping the poor must be founded in love for God, which will indeed combat any “compassion fatigue” (67). Third, I would have liked the authors to be more careful in describing how relieving poverty in the world relates to the local church’s mission. The authors frequently assert that Jesus’ mission is the church’s mission, which is theologically sloppy (38). They do nuance this claim somewhat (46), but it’s still problematic to apply all that Jesus does in his unique ministry as God incarnate to the distinct role of the local church as defined in the pages of the New Testament. If you are experienced with helping the poor, you may already be familiar with much of this book’s content. But if you’re new to all of this, then this book will be useful for introducing you to thinking wisely and practically about helping the poor. What a great way to serve others and build relationships for the glory of God so that the good news of Jesus Christ may be proclaimed and people may be reconciled to him! 1 9Marks is a ministry for church leaders. Steve Boyer is an elder at Capitol Hill Baptist Church. He lives with his family in Washington, D.C., where he works as controller for the Salvation Army National Headquarters.